But that’s not the kind of pain I was in for the past few days. I’ve got a gum infection. That was what I was told at a brief emergency appointment I managed to get with my dentist last Thursday after a night of toothache. He also told me that in the past antibiotics were usually prescribed, but these days dentists and doctors are encouraged only to give antibiotics as a last resort, because people in general are building up a resistance to them. He gave me a choice. I could have antibiotics if I really wanted, or I could try to get rid of the infection by rinsing my mouth with salty water as often as possible. He warned me that if I did it that way the infection could get much more painful before it got better. He was due to see me a week later – this coming Thursday – in any case, when I have an existing appointment for another matter. He said if the infection hadn’t cleared up by then, I could still have the antibiotics. I decided to be brave and do it the ethical way. If I had known then how painful it was going to get, I’d probably have snatched that prescription without hesitation, but I am glad I didn't. For the rest of the day I dutifully rinsed my mouth with salty water as prescribed, but by that night I was in so much pain I couldn’t sleep. On the Friday morning my husband and I were going away to the coast for a long weekend. I dosed myself with painkillers and off we went. By the time we arrived I realised that the painkillers weren’t doing anything. If I hadn’t been miles from home I would have phoned the dentist and begged for the antibiotics, but that wasn't practical. I decided to stop taking the painkillers, close the shutters on the window, go to bed and just ride the pain. I lay in a quiet, dark room – only getting up to use the bathroom and rinse my mouth with salty water – for 48 hours. I did drink water during that time, but didn’t eat anything apart from two yogurts. By midday on Sunday, the pain lifted. So, seeing as I spent my weekend away in waves of pain rather than enjoying the sea waves on the beach, why am I glad I did it (apart from the general goal of avoiding antibiotics)? Well, I came out of the experience wiser than I went in. I faced fears and learnt about my levels of endurance. I learnt that I can do without caffeine if I want to; that I can go for a couple of days with very little food if I have to. There were other realisations that came to me as well – more personal ones that I won’t be sharing with the world via a blog. I made a few promises to myself too – although the only one I’m making public is a promise to floss my teeth more often in future. 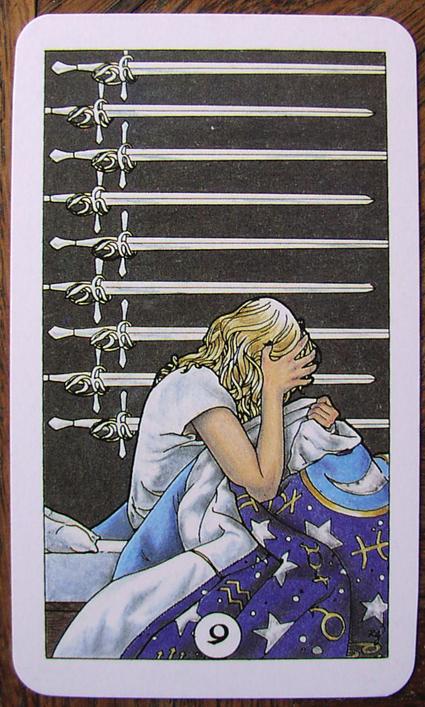 The photo at the top shows the nine of swords from the Robin Wood Tarot, which can mean dealing with personal pain and fears. 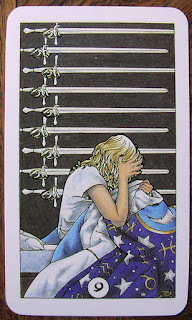 You can view the deck on Amazon. Note: This is not medical or dental advice. If you have toothache see your dentist and if you are unwell see your GP. I hope every thing is still ok. Thanks! I'm a lot better now.